As ISIS advances towards its borders, vowing to invade, Jordan reportedly planning for Syria ground op - but Obama admin afraid to commit. A jittery Jordan is preparing to create a security zone in southern Syria to fend off a possible jihadist advance across the border, in what would be the first such humanitarian "buffer zone" established in the civil war-torn country. According to the UK Financial Times, sources familiar with the plans say the buffer zone would cover the Daraa and Suwayda provinces, including the provincial capital city of Daraa, where the uprising against the regime of Bashar al-Assad first started in 2011. The aim will be to create a "safe zone" for both civilian refugees and moderate rebel forces, according to the paper. The idea of such a humanitarian buffer zone has been brought up on numerous occasions, particularly by Syrian opposition groups, but was never seriously considered by neighboring countries keen not to become enmeshed in a bloody sectarian conflict. But given ISIS's advances in Syria in particular - despite simultaneous losses against Kurds in the far north of the country - Jordan is now drawing up plans for creating one. Daraa city is currently in the hands of regime forces, but rebels have been making significant gains in the area and some analysts believe the city could fall in the near future. Although the rebel alliance fighting regime forces in the area is not a jihadist one, there are fears ISIS could do as it has done in the past: capitalize on the chaos and gradual withdrawal of regime forces and oust rebels, taking control of the area themselves. Jordan has already been involved in a limited US program to train several hundred moderate Syrian rebels to fight the Islamic State (ISIS) terrorist group. The Hashemite kingdom is also a member of the anti-ISIS air coalition operating over Syria and Iraq. But Jordan's government fears that despite a prolonged air campaign and ground offensives by indigenous forces - in particular Kurdish fighters - which have killed a large number of ISIS fighters, the jihadist group still could launch a cross-border offensive into Jordanian territory. 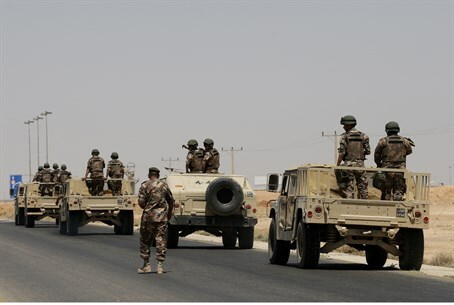 Islamic State has vowed to do just that on several occasions, prompting the Jordanian military to beef-up its presence along the country's porous border with Iraq in particular - where ISIS has come alarmingly close to its borders. But with ISIS is now advancing towards Jordan's far larger border with Syria as well - recently capturing the ancient city of Palmyra and moving towards Daraa - Amman apparently fears that situation could become unmanageable without proactive action. It is unclear whether moderate rebels from the Southern Front have been briefed on the plans, with several rebel commanders saying they hadn't heard anything about it. A no-fly zone would not be officially implemented, but Assad forces would be warned that any attacks on the safe zone would be met with an immediate response. The plan is believed to be backed by western members of the anti-ISIS coalition, but the Times cited key Obama administration officials as being hesitant to commit to any ground operation in Syria.